Today, the seminal work of Charles and Ray Eames, Isamu Noguchi, and their contemporaries has been co-opted by the likes of West Elm and even Urban Outfitters. While certainly commercial, this proliferation is actually in keeping with a core belief of Mid-Century's founding fathers (and mothers): The conviction that design should be functional, beautiful and accessible in both cost and aesthetic. Beyond furniture and decor, color plays an equally important role in creating a Mid-Century space. Though rich, mid-century colors are often somewhat tonal and offset by contrasts in value and hue. Deep jades and wood finishes are paired with airier cream tones. Images via Pinterest. Variants of complementary colors, such as warm rust and toned-down cerulean, are mid-century decor staples. Images via Froy blog (top) and Curbed (bottom). Another source of color inspiration can be found in the artwork of Bauhaus artists like Paul Klee, Annie Albers, and Laszlo Maholy-Nagy. These works all offer nuanced palettes that are right at home in a Mid-Century room. A split-complement color scheme, like the one used in this watercolor study by Paul Klee, allows for contrasting, dynamic hues that are also harmonious. Images: HGTV, Pinterest. 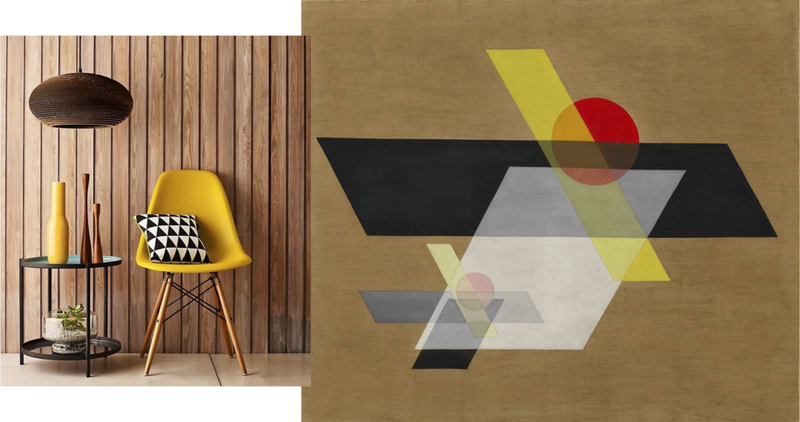 Annie Albers' neutral tones feel fresh and lyrical in geometric forms. Images: (L to R) brit+co, Alchetron, and digsdigs. It's not hard to find cost-friendly version of the classic Eames Dowel-Leg Side Chair (or just DWS as it's known to friends). Rove Concepts styled their iteration by using a vivid goldenrod in clean, contained shapes set against a more expansive, warm backdrop. Left: Rove Concepts; R: Laszlo Maholy-Nagy, A II, 1924. Whatever your personal tastes may be, the studied yet unconventional mid-century use of color fits just about every home.